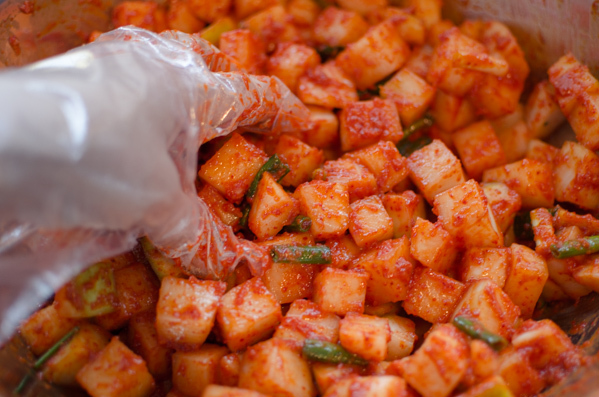 Who can resist the crunch, refreshing, and perfectly fermented Korean radish kimchi called “Kkakdugi”? One Korean food that I am dying to eat right now is a bowl of hot bone marrow soup (설렁탕, seolleongtang) and this kkakdugi kimchi as a side dish. I was lucky to get a bunch of Korean radish the other day and I am so~ so~ so~ excited to share this wonderful recipe with you. I was craving for the restaurant style cubed radish kimchi. I did some search to find out the secrets of restaurant recipes. And the answers I found have two similar ingredients that I already knew that they use in radish kimchi. One is the carbonated drink, and the other is the sweetened yogurt drink. 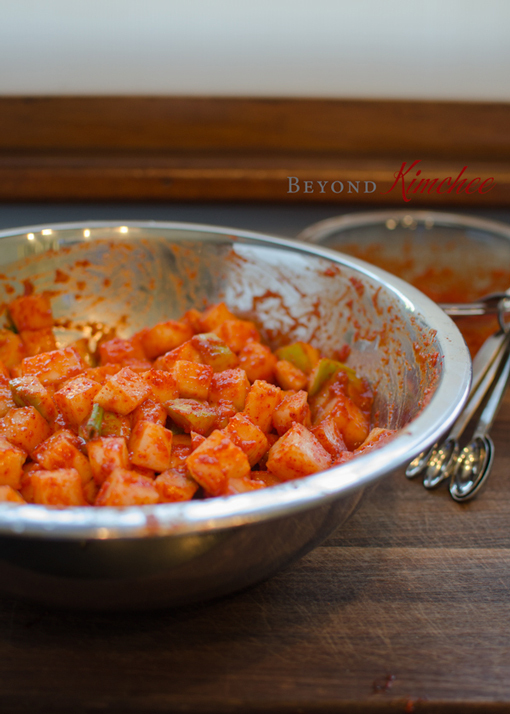 It is not so much different in terms of making the kimchi itself in home style vs restaurant style. And many home-cooks have been using the carbonated drink (such as sprite or 7-up) in their radish kimchi to mimic the restaurant flavor. Yogurt drink (such as Yakult) is another new idea, but I can’t prove how it will work since I don’t have any access to the Yakult where I live now. But.., you will be surprised to see what I added in the recipe to mimic the flavor. And it turned out to be the best Kkakdugi I ever made. No joke! Did I make you excited? 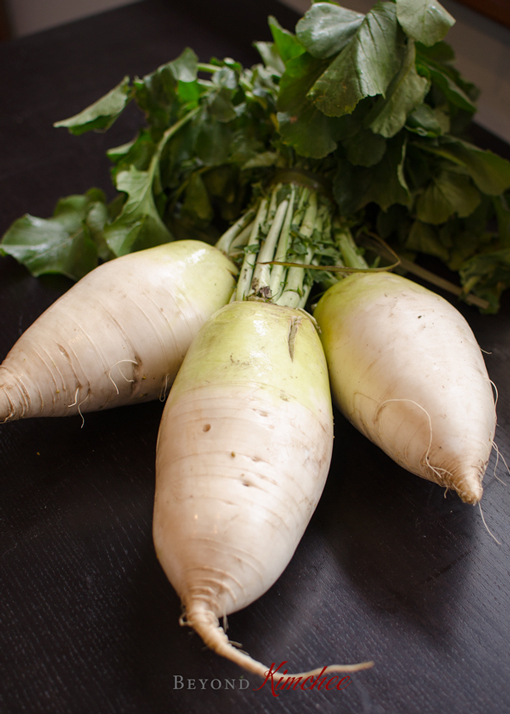 Before we start, let’s adore our star of the show for a moment; the Korean radish! You can add the green leafy parts of the radish if you want. I usually don’t. Instead, I freeze them and use them in the soup later on. Delicious! 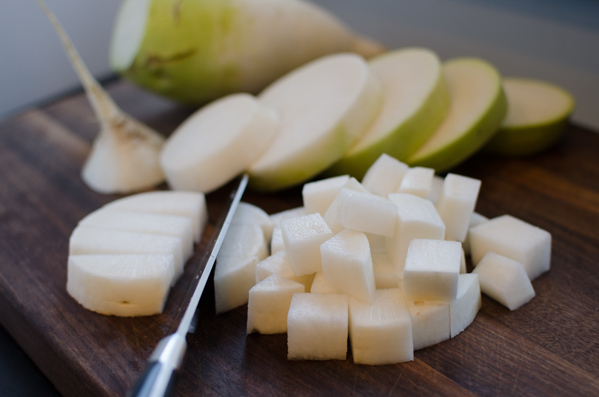 Slice the radish into 3/4-1 inch thick disks, then slice into cubes. They will reduce in size as they go ferment, so don’t cube them too small. In a large bowl or kitchen sink, sprinkle salt and sugar, and toss. Let them soak for 45-60 minutes. Some people add carbonated drink to mimic the taste at this stage but I don’t think it is necessary in this recipe. 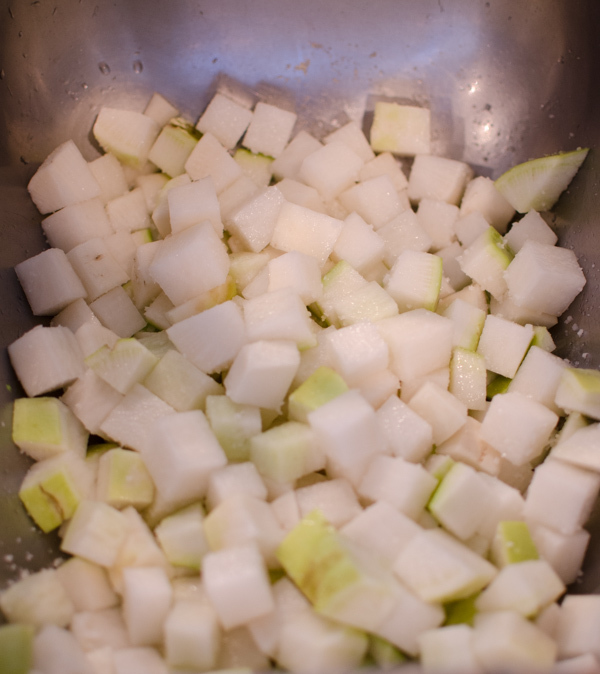 When the soaking part is done, rinse the radish cubes once, drain, and place them in a large shallow bowl. Sprinkle 1 tablespoon of Korean chili flakes and toss well. This extra chili flakes will help radish to keep the vibrant red color. In a blender, add diced onion, garlic, ginger, salted shrimps. Now here comes the “IT” factor of this recipe! “Is this milk?” Yes, it is. How bizarre to add milk in kimchi? Well, all I can say is that it DOES the wonder. 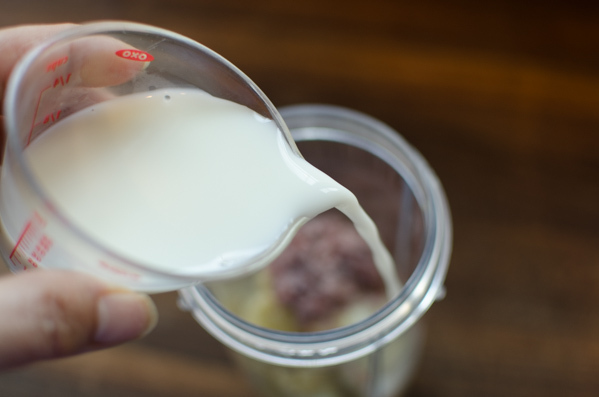 Milk will create a gas during the fermentation and it adds a very good flavor to the radish kimchi. 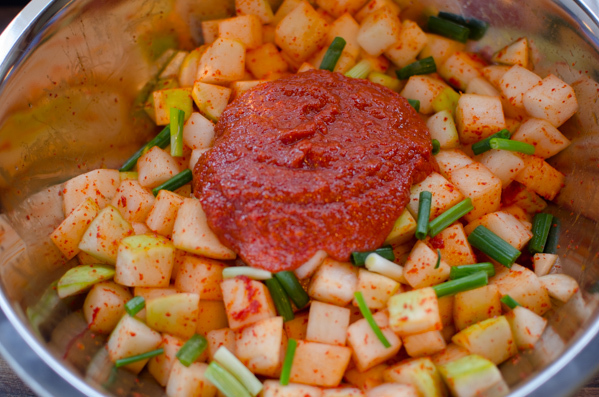 It won’t curdle, but makes your kimchi very desirable in both taste and texture. Add the chili flakes and anchovy sauce to the onion/milk mixture. I added Korean style corn syrup to the mixture. You can substitute the corn syrup with sugar instead. Pour over to the radish cubes. Add some chopped green onion to bring the contrast color! Toss together. Taste and adjust your seasoning by adding more anchovy sauce and sugar. Store them in a airtight container (Glass container with an airtight lid is the best), and let it sit on the room temperature for 1-2 days depends on your room temperature. You will see some bubbles forming on the surface. Then transfer to the refrigerator and continue to ferment for 7 days. You might want to keep a box or two of baking soda in your fridge to keep the odor off, so the smell won’t smear into the other food items. Nobody won’t appreciate the kimchi smell in their milk. 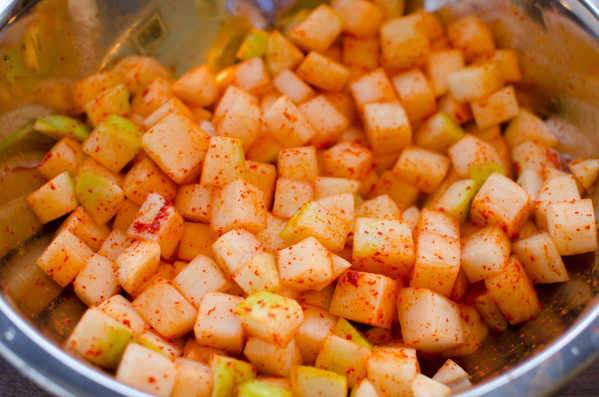 Below is the picture of my radish kimchi after 7 days of fermentation. Perfectly crunch and refreshingly cool! So good that I just keep eating one after another. Now, my Kkakdugi motivates me to cook up some nice bone-marrow soup to serve together. But for the moment, I just serve myself with a bowl of instant ramen noodle soup with it. Delicious! Clean the radish with a kitchen brush and rise well. Slice it into 3/4-1 inch disks, then slice into cubes. Place the radish cubes in a large mixing bowl or in a kitchen sink (with the drainage closed), sprinkle salt and 2 tablespoon sugar, and toss well. Let them sit for 45-60 minutes tossing once to soak evenly. Rinse the radish once and drain well. Put the radish in a large mixing bowl and sprinkle 1 tablespoon of Korean chili flakes and toss. Set aside. 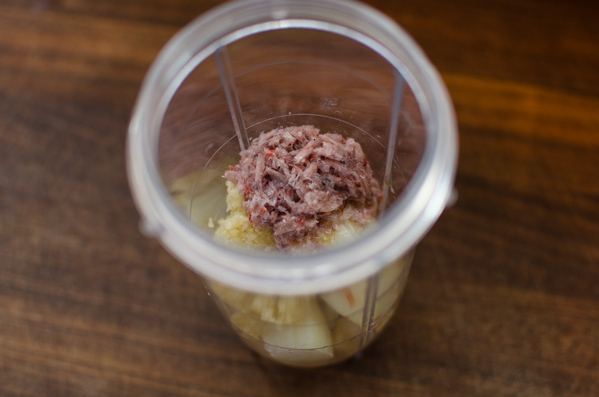 In a blender, combine onion, garlic, ginger, salted shrimps, and milk. Process until smooth. 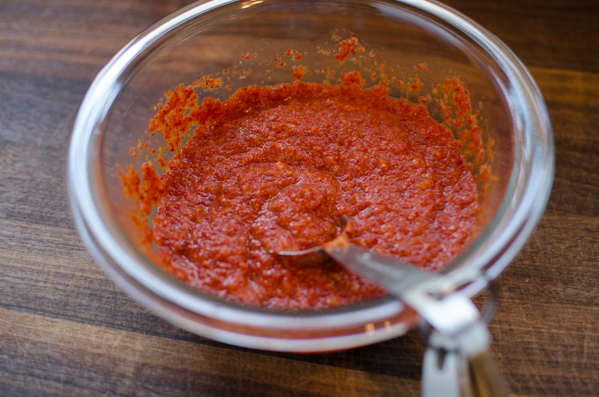 Transfer to a mixing bowl and add 4 tablespoon Korean chili flakes, anchovy sauce, and corn syrup (or sugar). Mix well and let it sit for 5 minutes. Combine the radish cubes and green onion, pour the chili filling, and toss all together until every radish cubes are well coated with the filling. Taste and adjust seasoning with more anchovy sauce and sugar according to your taste. Transfer the radish kimchi into an airtight container and let it sit in the room temperature for 1-2 days, then store in the refrigerator for 7 days for a good fermentation before you serve. Enjoy! It sounds and looks delicious! Can't wait to make it. Unfortunately, the radish I get at the market these days are not good at all - very spicy and almost bitter without any natural sweetness to it. I guess winter is the right season for radish. I put a few big wedges in with the last batch of kimchi I made (usung your recipe, thank you! ), but they were so bitter that I ended up having to take them out. Is there a remedy to this problem? Or do I simply wait for better radish season? I'm very curious to try fermenting with milk. Yummy...Thank you for sharing. Korean radishes taste the best in the fall. They are sweeter and milder. Taste the radish when raw and adjust the amount of sugar in the recipe. If your radish tastes bitter, increase the amount of sugar for soaking. Also increase the sugar amount in the filling too. That will help. Yes, the best option is to get the fall radish, but it is not always the case. Good luck! Hi Charlotte Sorry for the late reply. If you want to add carbonated drink or yogurt, it would still be the same amount. Chili flakes should be kept ina freezer once opened to retain its freshness. If not, they get moldy and smelly, and changes to dark color. Have fun making kimchi! The idea of milk is very interesting. Whey is often used in fermentation. I'll have to give this a go. 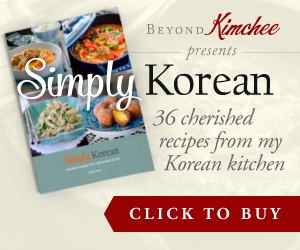 This looks like a good recipe - I love kimchee. I do have a question, though. What can I substitute for the shrimp? In my old age I have become allergic to all shell fish (and non-shell shell fish like calamari and octopi) and though I love it cannot safely eat any. Do you have a suggestion - other than just leave it out? I can eat anchovy and most other fish. Thanks so much. P.S. I'd rate the recipe but have not made it yet. Hi Kate, you can omit the shrimp and increase the amount of anchovy sauce. (Good thing that you are not allergic to anchovies!) Hope you get to try this recipe, and please, let me know if you have more questions. I don't add any shrimp or anchovy...my mom never used it, so I tend to prefer all my kimchee without the fish taste. Thanks for sharing the secret ingredient with us! Now you have me craving kim chi at 10:30 am while sitting in my office! Ha ha, sorry to make you crave kimchi in the morning. Hope your craving was taken care of soon after. kimchee is perfect anytime of the day! I have never tried korean radish before! you definitely have inspired me to go out and buy some to make this yummy recipe.. looks delicious and jam packed full of flavour. Thanks for sharing! I don't understand adding sugar, corn syrup, carbonated beverage, or yakult in kkakdugi kimchee. My Mom or grandma never add any of that to the Kimchee. I find that i personally don't like restaurant Kkakdugi for the unpleasant sweet aftertaste left on my tongue and now I know why. I 'll stick to making Kkakdugi they way my family makes it. Thank you for the restaurant version insight. Hi CKC Sweetener in the kimchi recipe is totally personal choice. If your radish is sweet enough, you provably don't even need any sugar. Everybody has their own way of making recipes differently than others. If you don't like the restaurant style Kkakdugi, then it is your choice not to add carbonated beverage in them when you make your kkakdugi at home. I agree some restaurant kkakdugi have a sweeter aftertaste. I also found that some people like that. Sweeter Kkadugi or not, that is the question. haha! I made mine yesterday and it's sitting in the kitchen. Eight more days to go!!! I love your recipes so so much as they inspires me to cook more proper way. You are amazing! I made it Holly. We just have to eat it after 3 days. Seven days were too tempted. They are well fermented and restaurant grade A++++ recipe. Thank you so mucho!!! what is salted shrimp? is it same as chinchalok? where can I find in sg? It is similar to chinchalok. You can find the Korean salted shrimps in many Korean grocery stores in Singapore. If not, substitute with chinchalok. Has anyone tried this with adding more vegetables, like carrots? Thanks, great recipe Holly. Hi, I want to try making kakdugi but since this has milk in it, do we have to eat it up quickly? The milk will help the fermentation. You need to keep the Kkadugi in the room temeprature for 2 days first, then continue to ferment in the refrigerator for at least 5 days before you eat. Hi Holly, Thank you for sharing your recipe. I notice you have another pose on radish kimchi which is slightly different from cubed radish kimchi. May i know if there is any difference in the taste? 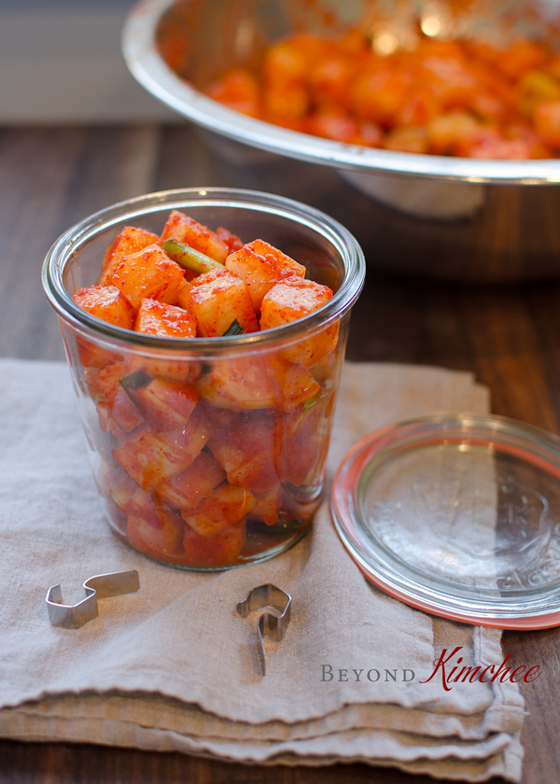 There isn't much difference in taste but the cubed radish kimchi recipe is closer the restaurant style kimchi taste, which is mellower yet pungent, while the other is more robust. Hope this makes sense. Thanks! Hi, Thanks for sharing your recipes...Can you convert 2 medium size Korean radish to pound, please? I'm really want to try your recipe ....thanks. Hi Suong 1 medium size radish is usually around 1 lb. So the total weight of the radish in this recipe could be between 1-1/2 to 2 lbs. Thanks! Hi Holly, Thanks for your quick respond...I tried it and waiting the result. Thanks again! Hi Holly.. 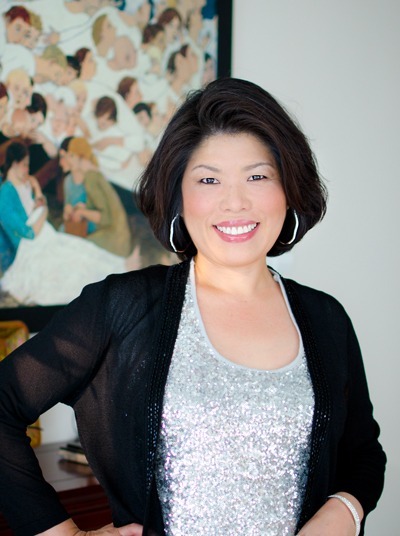 I noticed that you don't use any rice flour or starch on the recipe. Does the milk work as a substitute for the flour? Because all this time i always use rice flour on my kimchi. Thanks. 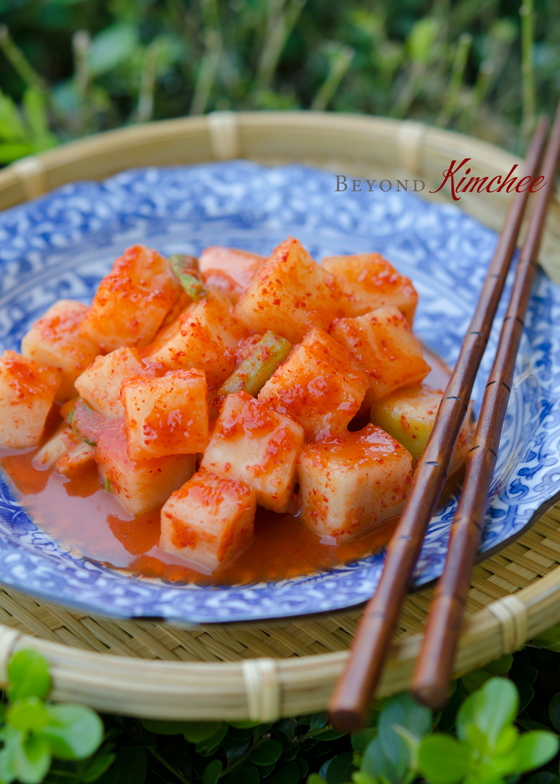 Unlike cabbage kimchi, radish kimchi can be made either with or without the rice flour or any starch component. Try this recipe. You will have a very tasting radish Kkacttugi kimchi. Hi! After fermentation will you still taste the milk? Am asking because my mum doesn't like the smell of milk. thks! No, you won't taste any milk at all. Yes, you can skip the milk.